Syrian opposition says the government launched a deadly chlorine gas attack on rebel-held enclave. The Syrian government was accused on Sunday by opposition activists of launching a deadly chlorine gas attack in the rebel-held enclave of Eastern Ghouta, Sky News reported, citing the pro-opposition Orient News which claimed a child had been killed in the reported attack by a regime aircraft on the town of al Shifuniyah. The Syrian Observatory for Human Rights also reported the youngster's death and said 13 people had suffered breathing difficulties. A U.S. medical organization said at least 16 patients in the hospital had symptoms indicating they were exposed to chemical compounds. 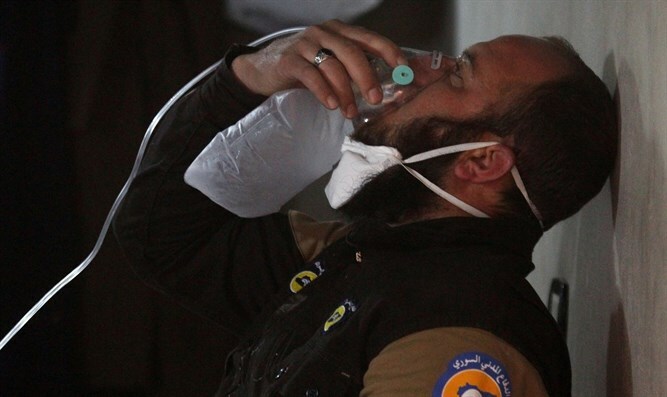 The Syrian American Medical Society said among those being treated with oxygen masks were six children and four women. The Syrian regime, which has repeatedly denied using chemical weapons, has been accused of several chlorine gas attacks in recent weeks, including two in January in eastern Ghouta, on the edge of the capital Damascus. The Trump administration recently accused Syrian President Bashar Al-Assad's government of producing and using "new kinds of weapons" to deliver deadly chemicals, despite committing to abolish its chemical weapons program in 2013. Fresh regime air strikes and heavy clashes shook Eastern Ghouta on Sunday despite a UN demand for a ceasefire, AFP reported. After days of diplomatic wrangling, the Security Council on Saturday adopted a resolution calling for a 30-day ceasefire in Syria "without delay" to allow for aid deliveries and medical evacuations. President Bashar Al-Assad's forces launched a major bombing campaign against the enclave on the edge of Damascus a week ago. More than 500 people have been killed since. The United Nations resolution has raised hopes of stemming the bloodshed but it remains unclear when or how broadly the ceasefire could be implemented. In Douma, the main town in Eastern Ghouta, fresh air raids and artillery strikes could be heard on Sunday, an AFP correspondent in the town said. At least eight civilians were killed in strikes on Sunday, according to the Syrian Observatory for Human Rights, bringing the total number of dead in the week to 529, including 130 children. An aid worker in Douma, quoted by British charity Save the Children, said there was bombing "just like any other day". Observatory chief Rami Abdel Rahman said there appeared be fewer air strikes but that fighting had intensified on the ground. Heavy clashes erupted in southern areas of Eastern Ghouta, killing at least 13 members of pro-regime forces and six fighters from the Jaish al-Islam rebel group, he said. The Britain-based group uses a network of sources across Syria to monitor the country's conflict. Eastern Ghouta is meant to be one of the so-called "de-escalation zones" agreed to in a deal struck by Russia, Turkey and Iran last year. In theory, such zones are meant to be areas where civilians can live without being targeted by any party in Syria's war. The violence has raged in the Damascus suburb regardless. A total of more than 340,000 people have been killed and millions driven from their homes in Syria's war, which next month enters its eighth year with no diplomatic solution in sight.